What is the biggest challenge you are facing in your supply chain? 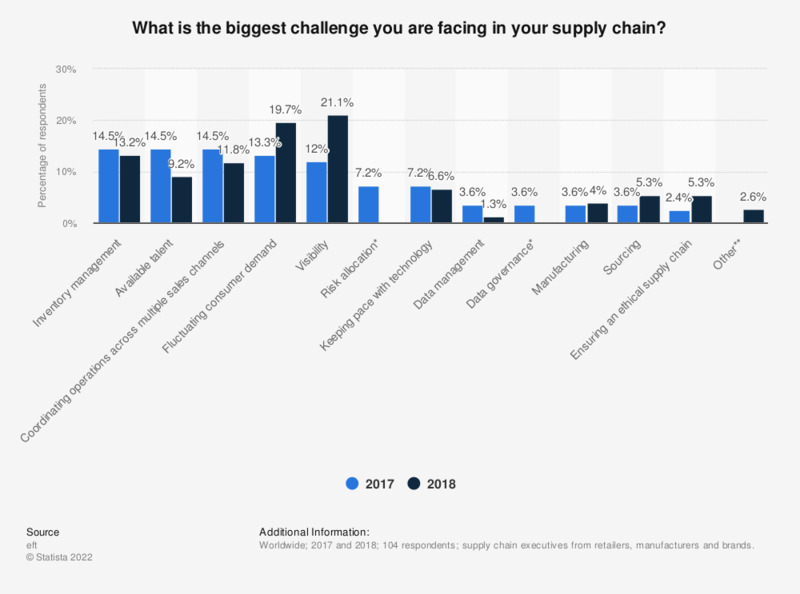 This statistic displays the biggest challenges reported by supply chain executives in 2017 and 2018. During the 2018 survey, 19.7 percent of respondents reported that their biggest challenge in 2018 was fluctuating consumer demand. supply chain executives from retailers, manufacturers and brands. The source doesn't provide the age of the respondents and survey method. * Answer not included in 2018 survey. ** Answer not included in 2017 survey. What are/have been the biggest barriers to your warehouse robotics implementation? Which of the following is driving increased spending in your supply chain? What is the biggest barrier for entry of talent into the supply chain? How is your organization spending on blockchain? What are you using to keep pace with customer experience? Which statement best characterizes your company's perception of supply chain talent?